Muara Jambi Temple is 30 km northeast of Jambi, along the Batanghari River. 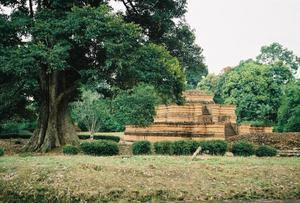 This site is considered one of the richest archaeological sites on the island of Sumatra. The eight temple-like structures appear to Buddhist, and were probably built around the 14th century. In 1982, a 32 centimeter tall female bronze statue was found at Koto Kandis, in the Muara Sabak subdistrict. It is believed to be the goddess Laksmi, holding a lotus bud in her right hand and an oil lamp in her left. In addition to the archaeological sites, many visitors find the riverside an ideal recreation and picnic spot.